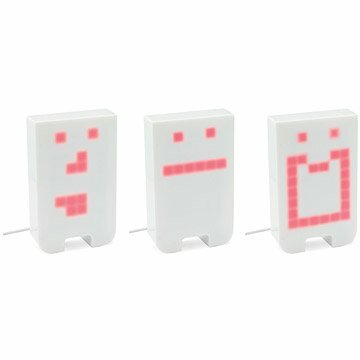 This USB-powered character lights up and lip-syncs to music and environmental sounds. Hours in front of the computer got you feeling a bit lonely? Have no fear, Tengu is here! Tengu is a USB-powered character that lights up and lip syncs to music, or your voice, or whatever noise happens to be around at the time. Tengu has different facial expressions that you can match to different music. When there's no sound he'll simply fall asleep, as soon as he detects some noise he'll wake up again. Tengu is a stand-alone device that does not require any additional software on the host computer. Created by designer Crispin Jones. Made in China. Click here to see Tengu in action! Crispin Jones is a London-based designer, whose work is chiefly concerned with exploring the social impact of technology. He graduated from the Royal College of Art in London with a Masters Degree in Computer Related Design in 2000, since then he has worked for a number of companies including Casio Research, Philips Design and IDEO London. He has also worked independently and in partnership (as one half of Robson and Jones) on interactive projects for a high profile clients including Tate Modern, The V and A and The Science Museum. Alongside the commercial design projects, he has produced more experimental works - these projects have been exhibited internationally. Additionally, he has taught at various international design institutions including The Royal College or Art (UK), Central St Martins (UK), Interaction Design Institute of Ivrea (Italy) and Schooling Pad (Japan). Easter Gift for 10 year old girl - don't know response yet. I am disabled and use extreme hearing aids....this little friend is the best sonic interpreter and doesn't seem to mind my atonal singing. Small gift for big fun! Finding fun gifts for my son who is an active duty service member is difficult. He has very limited storage space and must be able to transport things back to base in his travel bag. Mostly we buy him things that are necessary (socks and boxers, etc). When I saw this tiny little guy, that would fit in his stocking (and a pocket on the flight home) I was hooked! It is a fun and unique item at a very reasonable price. I bought Tengu for my husband, but my whole family had fun watching it. Easy to use - just plug it in. I had problems with getting it to work initially, but now I know the best way is to cover the microphone at the bottom with your finger, then uncover it and say something really loud straight to it. A cute little distraction. I use it in place of myself when I'm streaming. The only problems I have are the inactivity timeout is awfully short and he seems a bit finicky trying to wake him back up. I bought Tengu as a gift for my husband but my two kids, ages 5 and 9, love it! They talk to it, play music for it, and try to get it to make different faces. I was so excited to finally recieve my package, I am sooo happy I didn't have to sign for it and wait even longer since I work long hours. I got this for a friend and I know she is going to love it. I was hoping for something a little bit bigger, but as is, it is super cute and I can't wait for her to open it on Christmas. The packaing is impressive, you can't even tell there is an actual product inside (it comes in a super flat card board envelope box piece thing. It's a little bit pricey for what it actually is, but this company has proven to be reliable, efficient, and fast. Definitely placing orders in the near future. TENGU is so simple to use. Just plug it into the USB slot, turn on music or jibber jabber and have some fun. I was worried TENGU would not match the entertainment value that was portrayed in the online videos (the videos were great). But it turned out to be equally delightful in person as in the videos. We opened TENGU at a party. The guests could not help but play with TENGU. We got a note back from the teen to whom it was given. It turns out that TENGU has been a regular participant in his Italian Language class. Perfetto! Cracks me up all the time! Tengu is hilarious and works just as described. My four year old talks to him like he is real.... Only issue is that he only works 'properly' if he is plugged into a computer. We tried plugging him into a 'charger' that was connected directly to an outlet and he wouldn't relax..... that is he wouldn't go to sleep even if no one was talking... he would 'talk' anyway.. poor guy! : ) Really cute though..... cracks me up all the time, especially when you want to change a serious conversation into a not-so serious one. He is awesome at lightening the mood.